Christianity has been heavily influenced by the monastic movement. Just a quick listing a few names illustrates this point: Augustine of Hippo, Jerome, Benedict, Basil the Great, Boniface, Patrick of Ireland, Thomas Aquinas, Ignatius of Loyola, Martin Luther, Erasmus, John of the Cross, and Mother Teresa - there are many more. Among the positive contributions of the monastic movement would be the push of missions to new frontiers, the copying of New Testament manuscripts, social missions like the building of orphanages, hospitals, and a significant influence in the starting of universities, caring for the sick and dying in the Black Plague of Europe, and the continuation of what is known as contemplative prayer - and there are more. Monasticism is typically known for the practice of disciplines: prayer, fasting, celibacy, and vows of poverty. While these disciplines are found in varying degrees around the world in all Christian traditions, the different monastic orders are probably most responsible for keeping these traditions alive. These traditions are known as forms of asceticism (from the Greek: askesis, "training" like one would engage in to be an athlete) and are found in the New Testament (in varying degrees). We see some examples of askesis in the Old Testament: fasting, the Nazarite vow, and living in tents to celebrate the Feast of Tabernacles. Moses ascends the mountain to "meet with God:"
This has been seen by many as Paul's journey into the wilderness to get his head straight (after the examples of Moses, Elijah and Jesus). Paul (at least in Acts) affirms fasting, certainly affirms some kind of prayer discipline, and also gives at least a simple affirmation of celibacy. Philo was a contemporary of Jesus and Paul, living in Alexandria, Egypt. During the first century AD Alexandria had the largest population of Jews outside Jerusalem and the boundaries of Israel - it is estimated that 1.5 million Jews lived in and around the outskirts of the great Egyptian city. The world famous ancient library and one of the leading philosophical schools was located in Alexandria, and Philo was connected with both as a spiritual Jew, philosopher and somewhat involved in Roman politics. 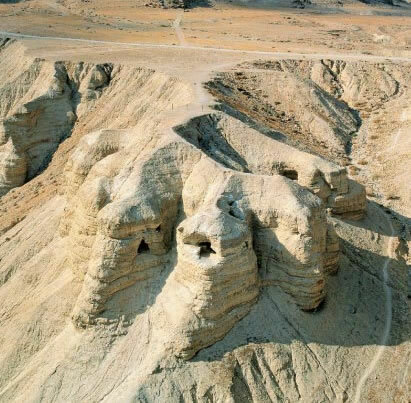 When the Dead Sea Scrolls were discovered scholars learned of the Essenes, another Jewish monastic group living very similarly to Philo's Therapeutai. This group lived in community, also in the desert environment near the Dead Sea, spending the bulk of their lives in prayer, fastings, reading the OT scriptures and waiting for the arrival of OT Elijah who would usher in the judgement of God to overthrow the Romans and the corrupt Jewish Temple system. Many scholars believe that John the Baptist lived with this group prior to his open ministry described in the gospels. This theory comes from John living in the desert, the similarity of his message with the Essenes (the coming of Elijah and God's judgement) and his call for water baptism. 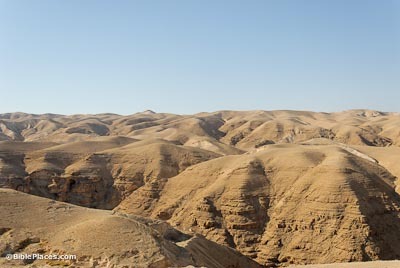 The Qumran community practiced baptism for soul and spiritual cleansing. The significance of the "Two Ways" teaching is that it can also be found in the Qumran texts, thus another connection between Jewish monasticism and early Christianity. Spiritual disciplines tend to flow from a fundamental belief of a spiritual battle between good and evil, the kingdom of light and that of darkness. This physical world is evil and the spiritual world is aligned with God. Thus for the person seeking spiritual union with God, to be a "soldier" in His army, there is a need to distance the self from the physical world of pleasure. Typically, this is seen as "worldly" pleasures: sexual sin, gluttony, greed, etc. This view of reality is sometimes referred to as dualism and can be found sprinkled throughout the teachings of Jesus and Paul. I have been correctly challenged by a reader in my use of the term dualism and I need to give some explanation. Proper dualism is a system that sees two equal and opposing spiritual forces, both primal or uncreated, like the Chinese yin and yang. In the mid-second century Marcion introduced a form of dualism that was rejected. He held that the god of the Old Testament was NOT the same as the God of Jesus in the New Testament. He dismissed the Old Testament and rejected anything that reminded him of this system. The Church rejected his system of thought. I am NOT a trained theologian. I agree with the correction of my reader - Christianity does NOT hold to dualism. Yet, I have been accused by trained theologians of presenting a form of dualism because of my view of a real "kingdom of darkness." THIS is clearly represented in the teachings of both Jesus and Paul. This view is reflected in the monastic tradition and is the foundation for the development of spiritual disciplines. Unfortunately this view of the universe is not easy to manage. It has not been uncommon for those who practice spiritual disciplines to take the concept further than what has just been described. In the second century we find forms of ascetic Christianity mixed with extreme dualism. Some forms of Gnosticism believed that ALL pleasure should be avoided and some Christian ascetics seemed to do this as well. Clement of Alexandria's Paidagogus (cir. 195-210 AD) lays out what and how the spiritual Christian will live: a disciplined life in how one eats, walks and speaks. Origen of Alexandria's writings (cir. 220-250 AD) further develop a disciplined approach to prayer and other spiritual disciplines. Origen lived a life of spiritual disciplines. His example of celibacy, though drastic, was seen as virtuous. Between 356-362 AD a document called the Life of Anthony begins to be circulated. This document is said to have been written by Athanasius, the great bishop of Alexandria as a tribute to Anthony just after his death. According to this writing Anthony was the son of wealthy Christian parents and inherited this wealth in his teens after the death of both parents. Around the year 270AD on a Sunday morning the preacher read from the story of the Rich Young Ruler: "Go, sell all of your possessions, give the money to the poor, then come follow me." Apparently the Holy Spirit gripped Anthony's heart. He follows this command and sets out to live a life totally given to following Christ. There were men at this time living as hermits, attempting to give themselves completely to following Christ. Anthony ventured to the edge of his village and began to give himself to prayer, fasting and working with his hands. This is the beginning of what turns out to be 10-20 years of living in solitude in the Egyptian desert. Over the years Anthony becomes known as a mighty man of God. People carried the sick to be prayed for by Anthony, according to the Life many are healed. Rulers sought him out for spiritual guidance and counsel. 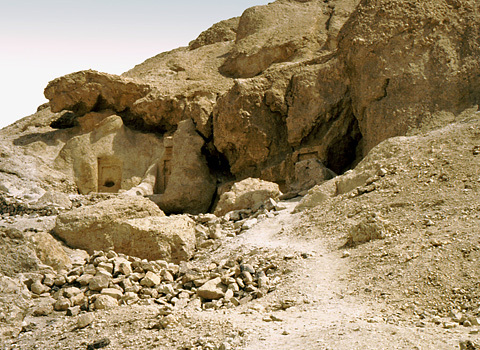 Over the years the legend of his life grew and many young men ventured out into the desert where he dwelt, seeking to follow his example and living in caves near Anthony. Athanasius comes to know Anthony and writes the Life of Anthony as a tribute to the great man. Some also believe that Athanasius used Anthony and the Life to promote his theological struggle against the Arians. The Life of Anthony spreads like a virus. Literally hundreds, then thousands of mainly young men (and some women) strike out into the desert to follow the new martyrs - those who willingly live in desert caves, eating very little (mainly steamed cabbage and bread, not much of either), giving themselves day and night to prayer, fasting and reading the biblical texts and other sacred writings (Clement and Origen were said to be found in some of these caves). By the later 320's it was said that over 5,000 monks lived in the caves of the Nile Delta in a loose, yet connected community. By 390 AD there were over 50,000 monks living this monastic lifestyle, though by this time many formal monasteries had developed. Even after monasteries began to be formed many men would continue to live in the loosely formed communities and the cave dwelling lifestyle of the early monks. 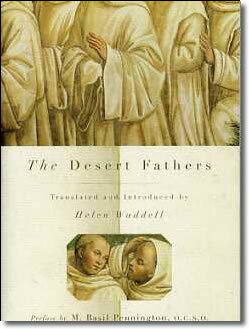 Several documents developed known as Sayings of the Desert Fathers. These documents help historians to know the details of this period and of these men. The Sayings of the Desert Fathers give us a glimpse into the asceticism, the practical theology, and the heart of what the monastic life was all about, at least in these early years. These Sayings were passed down orally among the monks until such a time as it was thought necessary to write them down. Much has been written to show the excesses of the monastic tradition - the overzealous use of discipline, self denial, and obedience to the common rule, competition (which community or individual had the most rugged practice), and dualism (that our flesh is evil). The Sayings is a collection of pithy statements and short stories which capture the heart and soul of the monastic life in the communities of the Egyptian and Palestinian deserts. The focus is to illustrate both the lives and the teachings of the teachers (referred to as abbot, old man, or pastor). There are short Books (chapters) which focus on various aspects of discipline; "Quiet and Solitude," "Self-restraint," "Fornication," one against material possessions, one on patience, humility, discretion, and other topics. The stories illustrate the virtues of different brothers and the lack thereof. Some of the stories show great insight, others are obtuse and hard to figure out. Some of the stories make the desert life seem very real, others are so legendary and ridiculous that one wonders why they were passed down at all. But that is really the point – these sayings are filled with enigma. It is very difficult to make generalizations; one story might affirm some abject discipline while the next shows the lack of virtue in the misapplication of the very same discipline. Like the scriptures, Sayings is a very honest presentation of these interesting men, showing us the positives as well as the negatives. [A note concerning women. The earliest "communities" we find in church history are those for virgins and widows. This was a highly esteemed group in the early church – they cared for the needy and were known as the prayer warriors in the church. The Sayings are sprinkled with stories of women living the disciplined life in the desert. Many of the stories with women indicate that women oftentimes attempted to hide their gender in order to remain in the disciplined life. It is interesting and curious to me that the author of the Sayings would show respect for these women even while reporting in the text that the women were hiding their identity. It should be noted that though this story seems to be an affirmation of great discipline and piety, Macarius' disciple was not happy that there would follow such torment and the other brethren seemed against it as well. Thus, even in an example of severe self-discipline we have some tension within the text itself as to the virtue of such practice. Macarius was one of the most extreme of these Fathers. I find very little attraction to him, but his ability to discipline his body certainly challenges our modern softness. This next story, though legendary in nature, is the most absurd story I have found about Macarius. I include it to show how self-discipline was often taken too far – I also find this story rather humorous. Macarius is said to have been bothered by his lack of self-restraint when he took vengeance on a mosquito which had bit him. In order to show his remorse and to learn more self-restraint, he went to a nearby swamp, stripped himself naked, and gave himself to the mosquitoes for a period of six weeks. When he returned it is said that he was so swollen from being bitten that he was only recognized by his voice. Another somewhat ridiculous story - this one comes from the chapter on "Not making a show:"
This abstemious brother is being rebuked for the pride in his self-discipline. If one were only to read the examples given above it would be easy to view these men as psychological misfits rather than true believers, but there is another side to the Sayings which must be taken into account. There is a story in Book V, "On Fornication" (or lust) where two brothers go into town together to sell their woven baskets. [These monks would weave baskets, then sell them for money to purchase bread, wine, salt and other necessities.] The two monks separate in the town in order to sell their baskets more quickly and when it was time for them to reunite one of the brothers does not show up at the designated place. The other goes about searching for the missing brother and finds him sitting alone in an alley. The "missing" brother is despondent and says that he will not go back to the community and his cell. When questioned he informs the other brother that while separated he had "sinned in the flesh." The second brother, "anxious to help him," lies by saying, "But it so happened with me: when I was separated from thee, I too ran into fornication. But let us go, and do penance together with all our might: and God will forgive us that are sinful men." These various examples show that there was more to these men than simply following a regimen of rules and disciplines. The Sayings of the Desert Fathers is a unique collection which indeed made its mark, not only on the development of monasticism, but on Christianity as a whole. Waddell comments how seldom it is that men criticize those who make similar sacrifices for science or for sport, "The only field of research in which a man may make no sacrifices, under pain of being called a fanatic, is God." (p.20) For many of us living in the 21st century, these men were a bit extreme. Their extremes, however, must not be marginalized as nothing more than misguided zeal. These men loved God and were trying their best to express that love. In a discussion about the Desert Fathers with one of my PhD instructors he commented that these stories were simply legendary, that nobody could live this way. I disagreed with him saying that as a young man I would have ventured out into the desert to live this way if I had known of such a community. My spiritual disciplines certainly did not approach what we read of these men, but I was desperate to please God. I cannot remember where this saying is found (I just searched John Cassian, Conferences but did not find it), but one monk was asked why he held himself to such a hard standard of so little food and water. The monk replied something like, "When my throat is parched with thirst and my stomach aches from hunger, there is no room left in my mind for lustful thoughts." Many young men in their teens, 20s and 30s will relate to this saying. The monastic movement evolved into (mostly) men seeking to live in community as they gave themselves to prayer, fasting, manual labor and study.